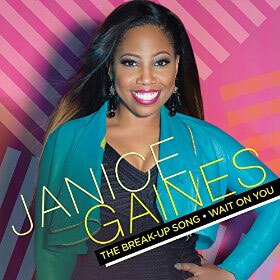 April 14, 2015 - (Nashville, TN) - Motown Gospel's, newest signee, Janice Gaines, releases two digital songs, "Wait On You," and "The Break-Up Song," today. Poised to bring in the next generation of urban contemporary Gospel music, Gaines' singles are now available online for digital download on all major platforms. As an added bonus, exclusive instrumental tracks available. "The Break-Up Song," featuring Eric Dawkins, is beat-driven, up-tempo and perfectly suited to be this summer's jam. "The Break-Up Song" offers ingenious, yet profound lyrics coupled with smooth vocals. Also, touching a chord with all who hear the song, "Wait On You," finds Janice offering soulful pop on a beautifully crafted ballad. Heralded as an emerging star on the label's roster, there has been an increased buzz about Gaines' forthcoming album after she introduced her music to key industry audiences in Los Angeles and New York. Janice Gaines teamed up with Grammy-winning producer, writer Lashawn Daniels (Michael Jackson, Whitney Houston, Destiny's Child & Tamar Braxton) for her forthcoming album, GREATEST LIFE EVER. This is the first time that the platinum-selling hitmaker has produced an entire faith-based album. "In a time when the world needs truth more than ever, Janice's talent and gift proved to me to be a powerful interlude to the Kingdom," said Daniels. "When I heard Janice's voice, I knew music would never be the same, and our personal visions for Kingdom music would be fulfilled." Gaines finds her own voice on the debut project which is slated for release later this year. Filled with clever lyrics, modern sounds and innovative tracks, Gaines hopes to reach beyond the standard gospel audience. Janice will be on the road this spring promoting her new music including an upcoming performance at the 17th Annual Grammy Block Party on May 12 in her current hometown, Nashville TN. Keep your eyes open for Janice Gaines and her GREATEST LIFE EVER, this summer.